Apple’s next big thing might not be something you can wear, drive, or even touch. It might be your body itself. According to a report by CNBC, Apple will be launching a group of health clinics in Santa Clara County called AC Wellness. The initiative will initially be limited to employees and their families when it launches this spring. Why this matters: Apple has becoming intimately familiar with health care ever since the launch of the Health app on iOS and the Apple Watch, so it’s not at all surprising that it’s entering the field. The question is whether Apple can disrupt health care. Apple isn’t just the most valuable company in the world, it’s also one of the most trusted. While the new clinics will likely be limited to an employee benefit for the foreseeable future, it’s not hard to imagine a world where we’re buying health care coverage through Apple rather than Blue Cross or Cigna. 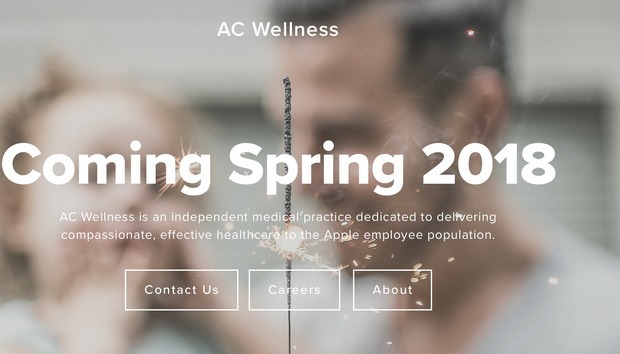 A visit to the acwellness.com web site describes the venture as "an independent medical practice dedicated to delivering compassionate, effective healthcare to the Apple employee population." Additionally, a photo on the site shows a picture of the the curved glass of the new circular Apple Park, where one of the clinics will be located. Numerous job listings suggest the AC Wellness clinics will be full-service facilities providing “unique concierge-like healthcare experience for employees and their dependents.” Among the current listings are a primary-care physician, acute care physician, nurse practitioner, and phlebotomist for on-site blood testing. Additionally, there are openings for a clinical exercise coach who will “help patients improve health and wellness through sustainable exercise and physical activity-related behavior change,” as well as additional positions listed on Indeed and LinkedIn. Sources told CNBC that Apple will use its new clinics as a way to “test out its growing range of health services and products.” Apple has already made a huge push into health care in recent years, using the Apple Watch as a way to study heart disease and working with hospitals to streamline patient records and test results. At a recent shareholders meeting, Tim Cook said Apple was in a position to “make serious contributions to the field. “We can ask ourselves, how can we improve the health of the user, not worrying about if we can convince the federal government to give us a reimbursement or not.” Part of the AC Wellness initiative will no doubt be focused on preventative care and fitness using Apple Watches and iPhone to track and motivate healthy living and active lifestyles. The first AC Wellness clinics are due to open in the spring.